I love finding common items around the house and making games with them. I recently came across a tin of dominoes and put those babies to work! 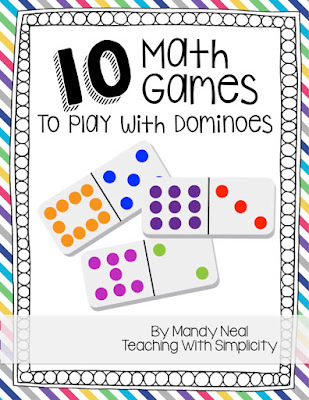 My students LOVE the idea of playing with dominoes even if they are sharpening their math skills while doing so! These games can be played alone or with partners. Partners tend to make them even more fun! Students choose five dominoes, turn them over, and multiply each side together. Order the products from least to greatest or greatest to least. Want to make it a game? Partners order their dominos then find the difference between their greatest number and least number. The partner with the greatest (or least) difference wins. Students begin with dominoes face down. Each student chooses a domino. On the count of three, students turn over their domino and multiply the dots on one side by the dots on the other side. The student with the highest product wins the dominoes. 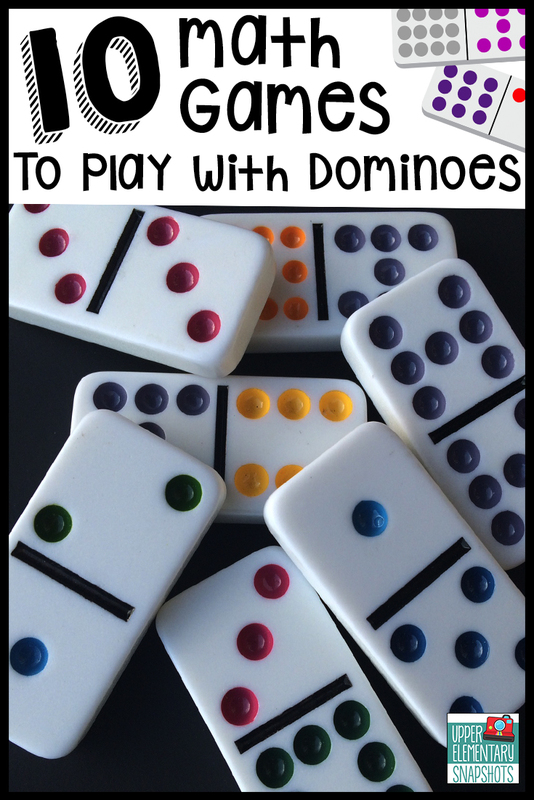 Add, subtract, or multiply the dots on the dominoes then sort the answer by odd or even numbers. Want to make it a game? Before the game begins state a rule. The partner with the most even numbers or odd numbers wins the set. Add, subtract, or multiply the dots on the dominoes then sort the answer by prime or composite. Want to make it a game? Before the game begins state a rule. The partner with the most prime numbers or the most composite numbers wins. 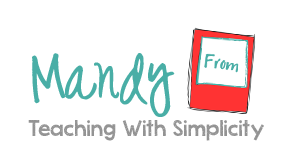 Provide students with a coordinate grid. Students plot points using the dots on the dominoes. One side is the x-coordinate; the other side is the y-coordinate. Students choose five dominoes and turn them over. One side is the whole number; the other side is the decimal. Order the decimals from least to greatest or greatest to least. Want to make it a game? Partners order their dominos then find the difference between their greatest decimal and least decimal. The partner with the greatest (or least) difference wins. Students choose two dominoes and turn them over. Want to make it a game? Each partner chooses one domino. Then, they compare their decimal. The partner with the greatest (or least) decimal wins. Add or subtract the decimals. Want to make it a game? Partners compare their sum or difference. The partner with the greatest (or least) sum or difference wins. Want to make it a game? Each partner chooses one domino. Then, they compare their fraction. The partner with the greatest (or least) fraction wins. Order the fractions from least to greatest or greatest to least. Want to make it a game? Partners order their dominos then find the difference between their greatest fraction and least fraction. The partner with the greatest (or least) difference wins. For a printable version of these games, you can download it HERE. This printable is perfect to laminate and attach to a loose leaf ring for easy access.